Open the Green Door and enter a New Orleans dream. The large front parlor will greet you with the charm and elegance that our city celebrates. A floor-to-ceiling bookcase stands before you. A vintage cellarette will be your bar. Both the parlor and the adjacent large bedroom surround you with armoires, elegant mirrors, fireplaces with ornate mantels and colorful old carpets are beneath your feet. 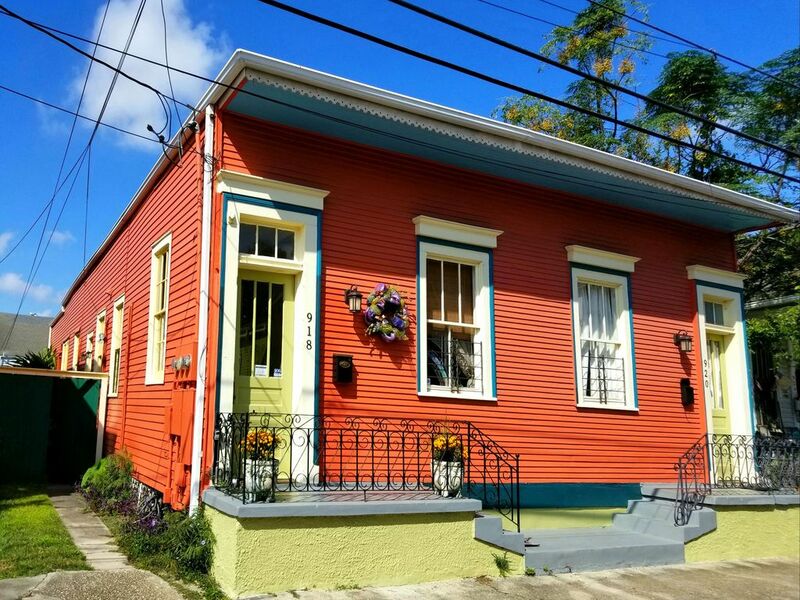 The home is located in the heart of the Marigny--which will put you close to everything . The bustling, up-and-coming St. Claude Avenue is one and a half blocks away. The Avenue is alive with funky dive bars, art galleries, eateries, thrift and junk shops--even theaters. Coffee shops abound! And restaurants of all kinds seem to pop up over night. The entire Crescent City is easily at hand. We are ten (10) walkable blocks from the French Quarter. Take the new North Rampart street car line only 5 blocks away, and you'll be there in 5 minutes! Or it will connect you to the entire city for the most affordable price next to walking . Bikes can be rented a few blocks away and buses also run up and down St Claude Avenue. Mardi Gras? The Season begins just 3 blocks from here with the irreverent Krewe De Vieux quickly followed by the hip, sci-fi themed Chewbaccus. And the Season ends in the same spot with the Ste. Anne and Ste. Cecilia walking parades where EVERYONE is the krewe and the costuming bar is set WAY high! Jazzfest? French Quarter Fest? Voo Doo Fest? It seems that we have parades, second lines and festivals one right after the other. Every once in a while, a make-shift gaggle of a parade will flow right past the front door. Or maybe you're here for a convention. There are oodles of them all year round and the Central Business District is just minutes away with your Uber or Lyft or cab app. NOTE to folks with dog allergies: Although no dogs are allowed in the space--they HAVE been in the space in the past. Your hosts are two sisters. Stephanie has an extensive and creative background in antiques and furniture refinishing while Marna has been busy for years as much historic architecture in New Orleans as she can manage. While we'll give you your space and privacy, we ARE on hand with, hopefully, helpful information--or help--if needed. LOCATION!! (As we always say). The hustle and bustle and all the fun is never far away--but you can come "home" for a respite in a beautiful setting. New Orleans herself is unique! It always has been--but now, in it's rejuvenation post Katrina, it has managed to both retain it's historic fabric and culture but become a mecca for entrepreneurship and artistic expression (we have the AirLift--a house that is an instrument! It is an acoustic marvel). I fell in love with the architecture in this city and this house was my first. I think you'll fall in love with it too! AC is provided by mini-splits. We'll teach you how to use them. You're welcome to use ours. It's not much--but it works! On the street--but seldom a problem. It's the parlor. TV is in the armoire. It is a dorm refrigerator. Automatic and we supply coffee, creamer and sugar. There is a handy kitchette.We supply dishwater and cutlery and basic staples. No separate dining area--just make yourself at home! Can be rented just a few blocks away. Coffee shops abound! The local Fresh Food Co-op is one block away and groceries can be "made" at the Mardi Gras Zone just a few more blocks away. Funky dive-bars and craft cocktail watering holes are plentiful and within walking distance. Restaurants from fine-dining (The Franklin, Feelings, The Country Club, Paladar 411), BBQ (The Joint) to the quirky (The Lost Love Lounge or Mimi's), Middle Eastern (Schiros)...you name it. It's all here. Night life litters St Claude Av and the local gold standard of Frenchmen Street is at hand. Art galleries. Even a couple of theaters (offering small presentations, slam poetry, plays and the Spotlight New Orleans Show is just up the block. You can look right at the newly renovated St Roch Market by standing out front in front of the house.